We've been busy making upgrades to the Defender Gate™ Lineup. Some upgrades include an Electronic Interlock option, Stop Latch, and Incremental Backcheck. Loading dock safety, and fall protection are an important measure to be aware of in any working environment. At US Netting we continue to evolve our products to provide as much safety as we can while keeping in mind you still need to work. The Defender Gate™ 10 & 20 can now integrate into your sequence of operations. The magnetic interlock provides an additional way to lock the gate. The interlock option is available on both the DG10 and DG20 model. Automate your dock safety process by integrating with existing dock equipment. Many warehouses are equipped with truck restraints, and a light system that can indicate when the dock is available for safe operation or it could indicate that it is not currently safe. Some industries use a green and a red light to show when a truck is fully attached to the restraint. Another common practice is to no allow the overhead door to open while the truck is not properly restrained. But what happens when there is no electricity? The Fail Secure Pin provides a level of security even if your facility experiences a power outage. Add a layer of safety and prevent unwanted entry. Customize how your gate integrates with other dock equipment like levelers, truck restraints, and more. Next, we've added a 90-degree safety stop latch. 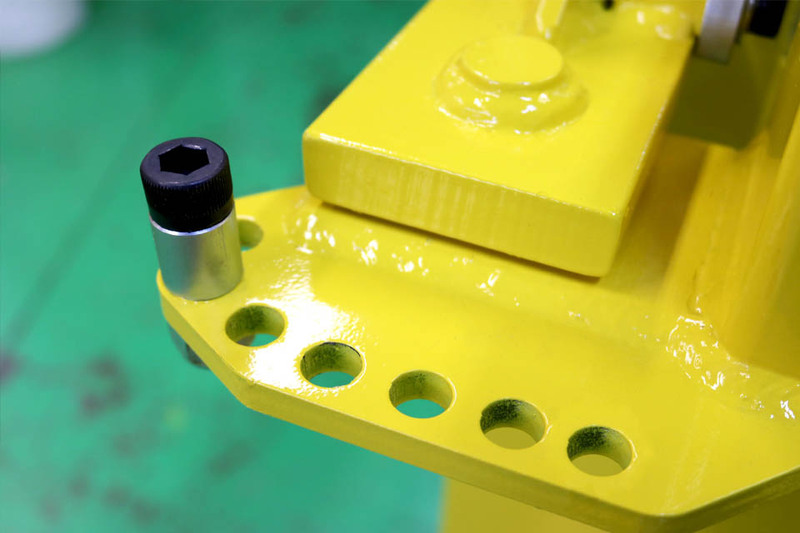 The latch prevents forklifts from backing into the gate and prevents it from closing on its self. When the safety stop is inactive, the gate can rotate into the opening. Enable the stop, and now the gate will stop at 90 degrees when it pivots inwards. When the safety stop is disabled the gate is able to rotate into the opening. This can pose a safety hazard as a lift that is backing out of an area might automatically think that the gate is open and held there. 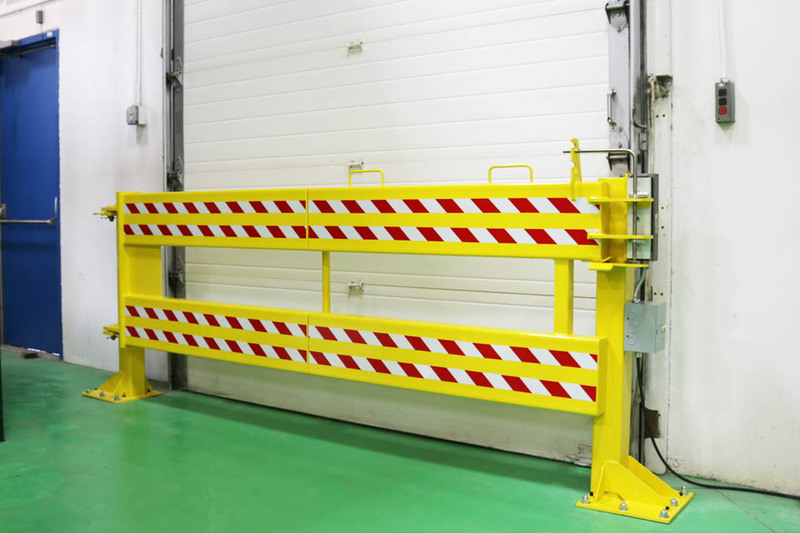 The safety stop is there to ensure the gate doesn't close on your personnel and cause them to run into the gate backing out of the dock opening or warehouse area. Each Defender Gate™ comes equipped with a 15-degree incremental backcheck. The backcheck limits the opening angle of the gate. Use the backcheck to shorten the swing radius outward into other obstacles. The widest setting shown here allows the gate to open to 180 degrees. The available range is 90 to 180 degrees with 5 15 degree increments in-between. When not used correctly the gate could block other openings, or in this case a fire extinguisher. Blocking a fire extinguisher, exit, or door opening presents a safety hazard. 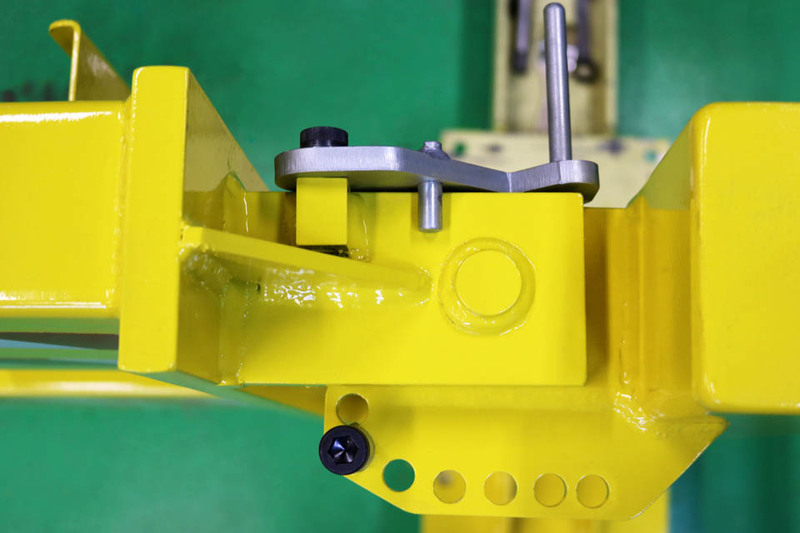 Reposition the backcheck to your preferred angle with the supplied Allen key and an open-ended wrench. For optimal safety and control over the gate use both the Safety Stop and the Incremental Backcheck together in tandem. At US Netting we will continue ot innovate in the realm of fall protection and industrial safety products to help your facility become the safest in the world. We understand that we are just one small piece of the puzzle but we hope that with the industries continued feedback we can solve the very problems that pose a threat to our clients bottom lines.